You could search for insights (signal) instead of just documents (noise)? Your social collaboration could center around insights instead of air? You acquired the tools to promote a culture of lean, mean evidence-based briefings? And since it all happens in a digital platform, it is no longer a black box -- you can see, measure and manage it all as it happens. According to CEB, 46% of executives misinterpret analyses provided to them and 61% 'selectively' use data. SALES: As-is sales-enablement consists of routing whole documents. Sales reps need to be experts faster, and Smartsnips are 50X smaller and more relevant than documents. CUSTOMER SUPPORT: The answers to most support questions lie deep inside documents and other content generated by the organization. Smartsnips provide a systematic way to surface it and make it accessible. EXECUTIVE BRIEFING & DECISION-MAKING: Executives need bottom-line information combined with a fast way to verify it. Smartsnips represent a leap forward compared to Powerpoints and binders of documents (with footnotes). And how much institutional knowledge walks out the door when employees leave? Nobody seems to know. Historically there has been no way to measure or track it. We intend to change this with Smartsnips. CORPORATE LEARNING: Given the speed of business and technology change, there is no way an L&D department can maintain a workforce of experts. The only scalable way to achieve this is for the workforce to train itself. And the only way for the workforce to retain what they learn long enough to apply it is to curate it. INSTITUTIONAL KNOWLEDGE: Given the rise of dynamic networks and the gig economy, curating knowledge so it stays inside the network is more crucial than ever. With Smartsnips, we are focused on provide a fast, convenient, workflow-embedded way of doing just that. Smartsnips are designed to capture the insights you form while consuming content (i.e. curate your insights). They contain an insight you author, a ‘snip’ of content that triggered your insight, tags, notes and the curated source itself – including the exact location of the ‘snip’ within that larger source. We believe they represent an atomic unit of learning/knowledge as they represent one insight based on one bit of evidence located within one source document. Why is it important to curate the source as part of the Smartsnip? Smartsnips are designed to be trusted, credible knowledge objects that can be shared with others, relied upon for use in knowledge work and have long-term business value. Curating the source and exact location within the source preserves the context and provides instant verification and credibility through 1-click access to the source and context. 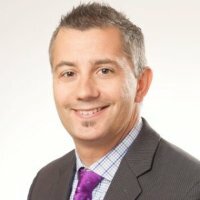 How do you create/author a Smartsnip? As you consume content with the aid of Smartsnips tools, when you form a new insight, you can capture the triggering excerpt with a mouse-swipe, enter your insight, tags and notes, and voila -- you have captured a Smartsnip. The curated source and exact location within the source is automagically captured and linked. Anyone with a Smartsnips account. What is the Smartsnips platform? Where does the software work? What content types are currently supported? 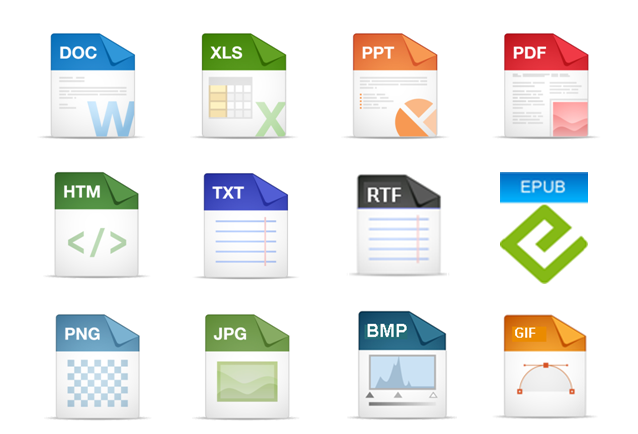 We currently support the curation and snipping of web content and most document formats including PDF, Word, PPT and other common text-based formats. Support for audio and video content is on our future product roadmap. Pandexio sells Smartsnips directly. Smartsnips are also available through our SI partners DXC/Tribridge. Smartsnips is priced on a Per User / Per Month basis, tiered based on the size of the organization. The Chrome extension authoring integration is included. Additional connectors can be purchased separately. How do we implement Smartsnips? Implementing Smartsnips is easy. Clients can be up and running as fast as 2 weeks and fully deployed in 6 weeks. Implementation involves account setup, setting strategic objectives for using curated insights to build and scale employee expertise and training of both insight authors and insight users. Who can see the Smartsnips I create? You control the visibility/privacy of Smartsnips you create within the Smartsnips cloud. The default setting is ‘company’ so your Smartsnips will be visible to anyone in your company – this is to encourage broad sharing of knowledge. You can set them to be visible only to you or a specific team in cases where they involve sensitive information. Can I share Smartsnips with my co-workers? Yes, in fact the primary goal of Smartsnips is knowledge sharing with co-workers. The Smartsnips Cloud provides an easy, automated way to make your Smartsnips accessible to your co-workers. Can I share Smartsnips with someone outside my organization? External sharing is currently supported through the ability to whitelist external email addresses into teams. Other means of sharing externally are being considered as part of our future product roadmap. Yes, if (1) you are the author, and (2) nobody has yet ‘relied’ upon your Smartsnips by sharing them with others or adding them into a topic or hyperpoint. You cannot delete Smartsnips you did not author. For Smartsnips you author, you can always edit your insight, notes and tags (at any time). You cannot edit the Smartsnips you did not create, although if you incorporate Smartsnips into Hyperpoints, you can add your own insight that will show in place of the author’s original insight. Can others delete or edit my Smartsnips? No, with the exception of administrators who can remove documents and all associated Smartsnip content. We estimate the average Fortune 500 company generates 50 Million insights per year as employees consume content, learn and think. Insights that are used to solve problems, make business decisions, create new IP and innovations. So where are these insights? Today they are scattered across brain cells, documents, sticky notes and an array of systems. They are all offline, inaccessible, non-shareable and effectively walk out the door when employees leave. The Smartsnips platform enables systematic capture across existing systems and content, all stored in one centralized platform that is accessible anytime, anywhere on any device. Swipe your mouse, capture your insight, add tags and voila! Employees need to access knowledge faster. Today's as-is search returns a list of documents and links - a reading and research project. Employees need to share knowledge better. Today's as-is involves just talkin' on one extreme, whole documents attached to posts on the other. Sales reps need to be experts faster. Customers are more educated than ever. As-is sales-enablement consists of routing whole documents. Sales reps don't have time to read it all (nor do they want to). Executives need bottom-line information combined with a fast way to verify it. They usually get a Powerpoint and sometimes a binder full of documents to read (or footnotes to chase). The answers to most support questions live inside the reams of documents and online content generated by the organization. Until now, there has been no systematic way to surface it. Employees need a fast, lightweight, workflow-embedded way to capture what they know. The as-is solutions don't meet these key requirements and therefore don't get used. Given the speed of business and technology change, there is no way an L&D department can maintain a workforce of experts. The only scalable way to achieve this is for the workforce to train itself. Today, everyone is a researcher. We need to make it efficient. The as-is involves too many documents, file systems, sticky notes, footnotes, bookmarks... sometimes even piles of printed paper and highlighters. Employees data mine daily as they consume content. Today, they capture this output in sticky notes or between their ears. Employees are the most powerful big-data generators we have and Smartsnips unlock this value. Memorizing everything is an ineffective and burdensome way to build team knowledge and expertise, particularly when they forget 90% within 30 days. Smartsnips relieve your employees of this memorization burden, and amplify their abilities to acquire & apply expertise. Information overload is a primary cause of employee disengagement and the load is only going up. Smartsnips provide a much more efficient and sensible way of working with information by directly capturing and managing the actionable 2%. Lean has transformed manufacturing productivity and is now the predominant process management methodology for services organizations. 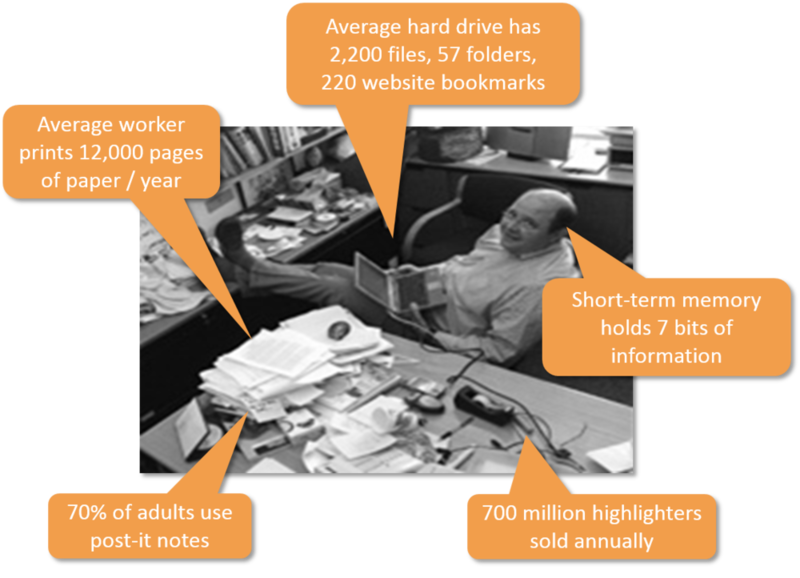 Storing and sharing whole documents and web pages, when only 2% is relevant and actionable, is the opposite of lean. By 2020 Millennials will make up half the workforce. In their consumer life, they prefer systems like Twitter and Pinterest, condensed forms of information they can consume fast. Smartsnips apply this same concept to the world of business content. Half the devices on corporate networks are now mobile, and social networks are how Millennials prefer to communicate, collaborate and work. Whole documents are too big and bulky within these environments, whereas Smartsnips are just right. To the right is an illustration of how Smartsnips can create a 98% reduction in the size/quantity of information. Smartsnips take seconds to re-access and consume compared to whole documents that can take minutes - hours to re-find and re-read. 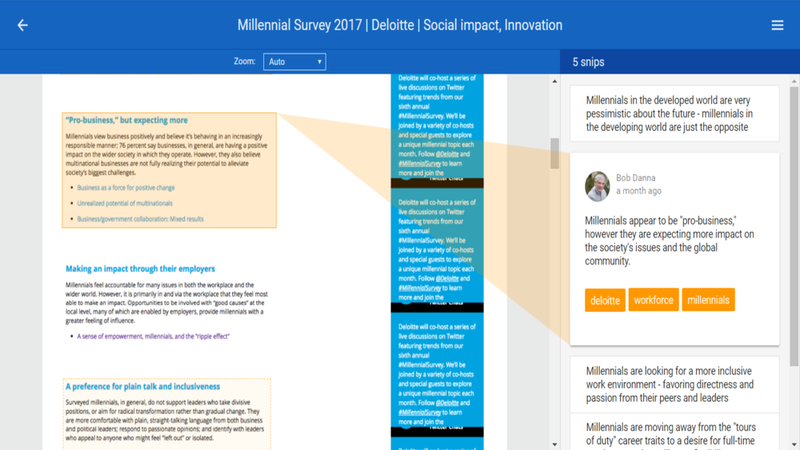 When employees filter content, they apply their pre-existing knowledge and work context to isolate the most relevant parts. Today, company knowledge is scattered across documents, sticky notes and employee brain cells – offline, non-shareable haystacks of information. 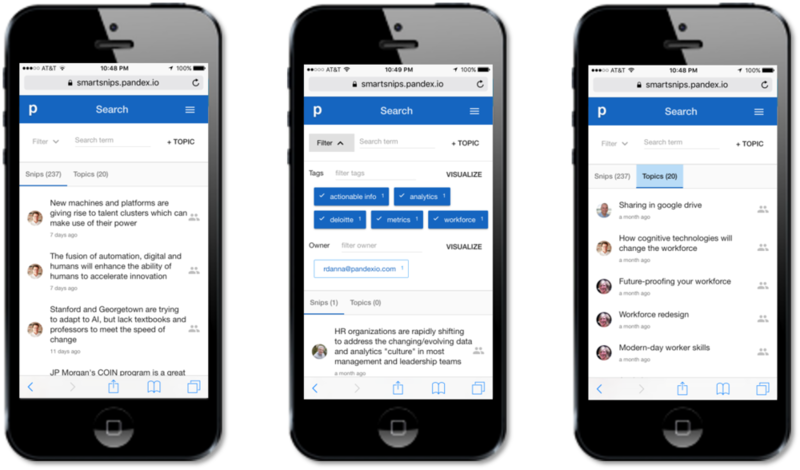 Pandexio is designed to plug into existing systems where employees work with content (/haystacks), and make it easy for them to extract and collect the needles as they go along. We call these Smartsnip-enabled applications. They can power the capture and centralization of employee knowledge at an unprecedented level of simplicity and scale. Smartsnip-enabled applications enable employees to work with needles instead of haystacks, accelerating business processes, starting with the most basic of all: reading and learning. Attached documents come to life and you can see who is learning what before you even open the document. You can also click directly into the snip-set, bypassing opening the document entirely. Whenever you click on documents, they launch in Smartsnip-enabled web viewers. Smartsnips make it easy to capture the needles from the haystack simply by drawing a box with your mouse, adding a title and tags. Don’t have time to read? Just flip through the Smartsnips of others and their knowledge becomes yours. No more memorizing, sticky notes or searching for documents to re-read. 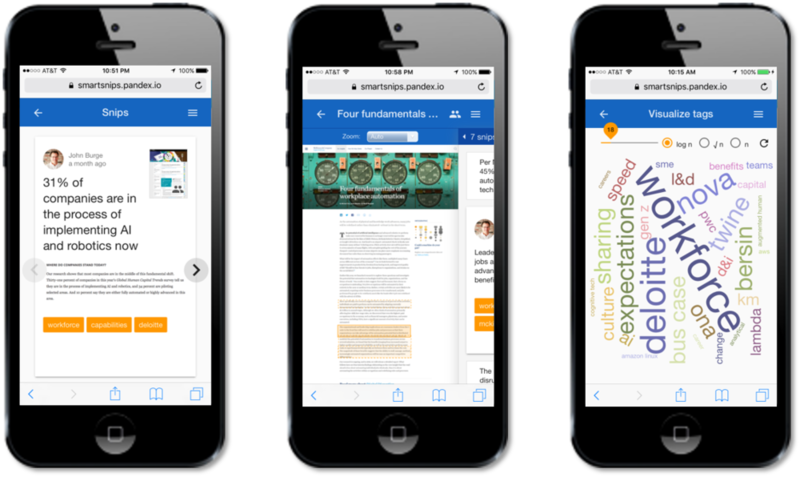 The important facts, findings and knowledge get unlocked from content and brain cells – converted to portable, permanent knowledge in the form of Smartsnips. Highly accessible, rapidly consumable and automatically shared across teams or even company-wide. Do you forget the sources of your facts? Distrust your co-workers to do any better? You can stop trying to maintain footnotes in your head. Every Smartsnip is self-referencing. One click on the see in source button and the document auto-magically re-appears, rotated to the exact page and snip spot. All Smartsnip-enabled applications feed a single Smartsnip network for the company. No matter which Smartsnip-enabled application was used to create the Smartsnips, they go to one spot for your company, where you can access them based on your access rights. Ever wish you could “Google” the knowledge of all your co-workers? Not just their self-reported areas of expertise from a LinkedIn profile, but what they read and think, how they interpret information and form their points of view and conclusions? Now you can – and it’s fast and powerful. Your brain gets overloaded with stuff to remember and recall when needed. Now you have a pocket brain, with unlimited storage, zero-decay memory, auto-networked to everyone else’s in the company. Endless possibilities, limitless capability. Smartsnip functionality can be embedded inside most web applications, directly into browsers – just about any application where employees consume content and collaborate. They represent an atomic unit of knowledge: a piece of content, the context where it came from, and a user-assertion about the piece of content. They are dead-simple to create. If you can draw a box with your mouse, you can create a Smartsnip. THEY ARE ORGANICALLY GENERATED BY USERS CONSUMING CONTENT IN ANY APPLICATION WITH A SMARTSNIPS-COMPATIBLE CONTENT VIEWER. THEY ARE SELF-REFERENCING AND ALWAYS RETAIN THEIR CONTEXT -- THE UNDERLYING DOCUMENT -- WHICH IS STORED IN A UNIFIED FORMAT REGARDLESS OF INITIAL FILE TYPE. They each have their own URL. And they change all the time. This is why we designed Pandexio as a platform that can plug-into just about any system for the capture and use of Smartsnips. Employees attend $200B worth of corporate training annually -- where does all the "new knowledge" go? Not the most reliable place to store information. According to the Ebbinghaus Forgetting Curve, 42% is gone within 20 minutes, 72% within two days. Even if we assume some employee adoption of the latest-greatest memory/repetition technique, odds are that half the corporate training budget evaporates into the ether. Memorization is just as effective in the corporate world as it was in Middle School. 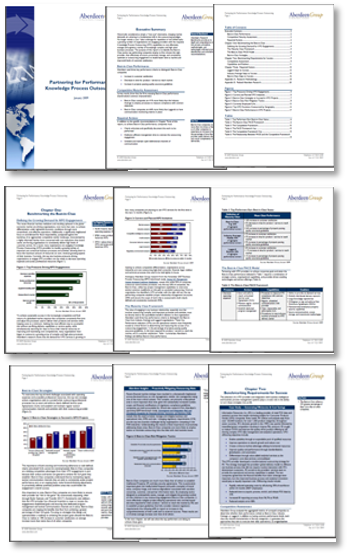 The typical take-away from corporate training is a bunch of documents. They will get filed away (hopefully), and to re-access them, the employee will have to remember the name of the folder, sub-folder, sub-sub-folder.... and ultimately the name of the document. Then, if they find the document, they have to read the document in hopes of finding what they were looking for (if they can still remember it). Why do we continue believing that drumming information into people's heads is an effective way to train them? We should not have to memorize everything. Not in today's hyper-information world. Not when the average 5th grader can access turn-by-turn directions to an address in a different state in 15-seconds on a smartphone (complete with a satellite view of the surrounding buildings). Why can't our OWN KNOWLEDGE be this accessible If it was, we would not have to try and store so much of it in our brain cells where it decays faster than we learn it. At some point in our childhood education, we all experienced the teacher who let us use our notecards on the exam. What a relief that was! Instead of memorizing the entire chapter, and trying to keep all the information in our heads, we just needed to have rapid-access to it in our notecards. Well, we can finally do the same thing in corporate training. 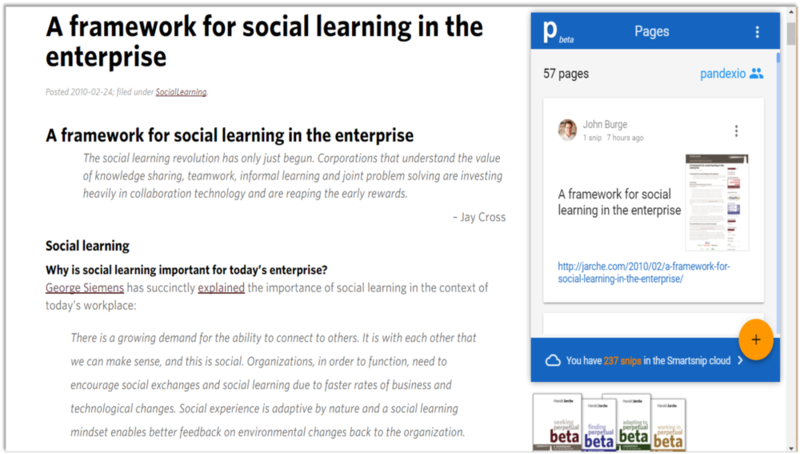 How would employee performance improve if they could quickly re-access what they have read and learned? Consultants get hired because they are experts, and are under constant pressure to acquire new knowledge and show it. Smartsnips can aid them in learning and remembering what they read about new processes, companies and industries. By accelerating this process and increasing retention, you will keep your consultants looking like the smartest people in the room. Anyone doing research is under pressure to provide actionable insights that lead to the next solution or discovery. The quantity of information they have to consume, digest and apply can be staggering. Smartsnips enable researchers to quickly parse mountains of content, and boil it down to manageable snips of relevant, bottom-line information. Keeping each fact associated with a source document saves time and effort when creating footnotes and bibliographies. Innovators must constantly demonstrate in-depth knowledge on the problem they solve, their market, competitors, business models and a host of other topics. Doing this well is crucial to gaining support and getting the product right. Smartsnips arm the innovator with facts and trends at their fingertips, enabling them to demonstrate their expertise every step of the journey. Today's customers expect sales reps to be experts on their products and services. Perceived expertise and trust go hand-in-hand, and superior knowledge can translate into superior sales. Smartsnips enable sales personnel to amplify their expertise by placing product and service knowledge at their fingertips. Support personnel operate in a highly time-sensitive environment and are expected to learn more information faster than ever before. While structured knowledge bases certainly help, much of the information support needs to know is buried within technical documentation, or scattered across the Internet. Smartsnips enable companies to generate people-powered knowledge bases that turn unwieldy unstructured data stores into actionable intelligence for providing answers and solutions. Your thought-leaders and bloggers produce knowledge as their product, need to stay current and continually demonstrate their expertise. This can be daunting in a fast-moving knowledge economy. Smartsnips helps them accelerate and manage the process of knowledge acquisition and organization, enabling them to quickly and credibly make their points. Content often plays a central role in team collaboration. All too often, this collaboration occurs at the whole-document level, when it needs to happen at the sub-document level -- the facts, findings and insights contained within the content. Smartsnips enable team collaborators to focus on the relevant 2% so they can analyze and interpret it as a team. Meetings and presentations are notorious for lacking substance -- the very facts, sources or other evidence necessary for reliable decision-making. Smartsnips incorporate these elements into their very design, and can add a much-needed dose of evidence to decision-making processes. 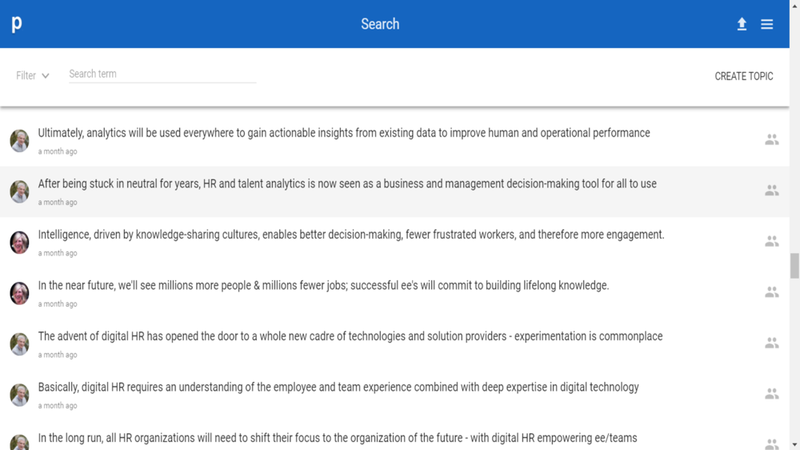 The first step in harnessing people-powered BI is to plug in our web-based document viewer to enable users to capture Smartsnips as they read and think. We have made this simple by packaging it as an embeddable widget that encapsulates the API calls. Depending on the host system, integration can be as fast as a few hours and a single line of code. 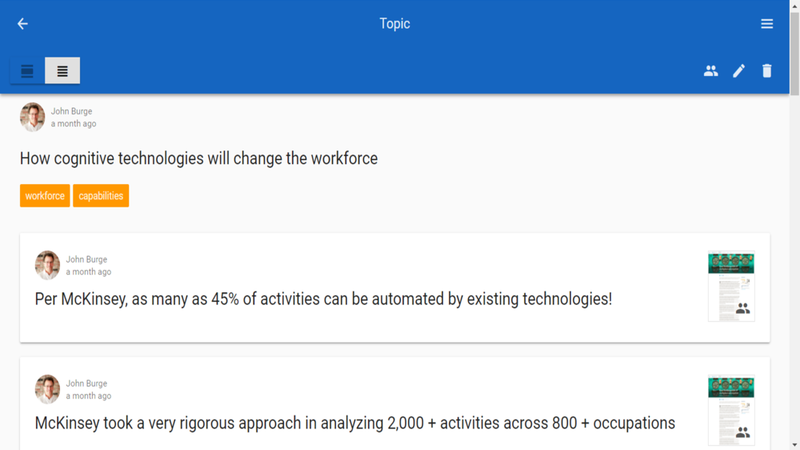 Based on granular time-task analysis that assumes $100k fully-loaded annual employee cost, and that these five activities collectively comprise 7% of knowledge worker time. Analysis showed 33% - 75% step reduction across multiple systems, offline note-taking, referencing, re-finding/marrying. Analysis details available here. “The fastest way to make sense out of mounds of content." Individual files can be up to 25MB. IS YOUR MEMORY LIMITING YOUR CAPABILITY? 1. Make smarter use of your existing ("mushy") brain. Your brain excels at processing – reading, understanding and analyzing information – and then forgets the results as fast as it generates them. This can be a problem if people expect you to know stuff – like your clients for example, or your boss. Fortunately, Pandexio excels at capturing, storing and re-accessing the important stuff you learn from content you consume. This way your mushy brain can focus on higher-level functions like critical thinking, connecting the dots across disparate information sources, or which sandwich you should order for lunch today. In today’s information-intensive world, there is no way to read or learn everything. Now you can have the best of both world’s by acquiring the knowledge of people you know simply by linking to them. This is particularly powerful when they have synthesized their knowledge on a topic down to a Hyperpoint – which can allow you to sound like an instant-expert on a topic you know little about. Check out an example of how we do this at Pandexio (video to the right).